With the Time Xpresso pedal, Time has finally gotten about as close to the ride feel of their original 1991 pedal as they are probably ever going to get. The Xpresso could even be considered road pedal perfection if it weren’t for one small but significant oversight. Luckily there is an easy fix, and that one design flaw doesn’t cancel out the overall excellence of the pedal. Time is the undisputed leader in pedal biopositioning, having made a name for themselves with their first pedal, the Equipe, back in 1990. Although the pedal designs in between then and now have not always lived up to that monicker, Time has consistently been the only pedal manufacturer catering specifically to the needs of bicycle riders with sensitive knees. 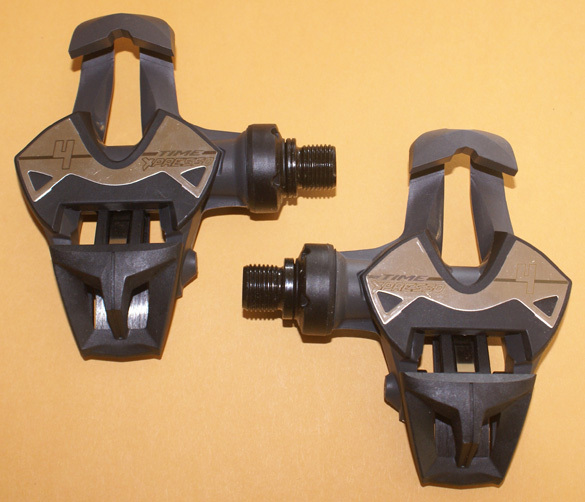 Since their flawed iClic pedal, I had switched to both a set of Shimano Ultegra road pedals and to Time Atac mountain bike pedals, neither of which provided the knee-friendly platform I needed. The Shimano pedals have their long-time clunky float which produces knee pain on longer rides, and the Atac lacks a wide platform, causing my foot to turn over the edge when I get the tiniest amount of wear to the cleats, which results in consistent knee pain after rides. Knee pain forces undesired time off the bike to rest and recover. I had spent the better part of a year dealing with persistent knee pain from riding, harkening back to 1990, before I tried the first Time Equipe road pedal. Having a pedal that supports the BikePT philosophy of fitting the bike to the rider, with easy custom cleat angling, a completely smooth and tight float mechanism, and best of all pain-free cycling puts me in riding heaven. Enter the Time Xpresso. Time offers five different models of Xpresso pedals, starting with plastic resin and upgrading materials (and price) to carbon fiber and titanium to appeal to every budget. The pedals are super lightweight no matter which model you purchase, and are functionally identical through the entire line. Tools needed: a piece of 220-grit sandpaper. The only negative thing about the Xpresso is its razor-sharp edges, which will easily slice your lower leg skin right open. This is particularly important when you consider that we tend to walk beside our bikes from the garage/yard to the street, stopping at a cafe, or lining up for a race. If you happen to graze your outer calf or ankle with an Xpresso pedal, which is quite common, out-of-the-box these pedals will cause everything from superficial scrape wounds to deep lacerations. I have two pairs of the Xpresso 4 pedal, and the problem was present on both. The arrows indicate pedal areas to steer clear of, which are so sharp they will cause deep lacerations by merely brushing against your legs. The design flaw: beautiful lines, but unfortunately razor-sharp. Time Xpresso pedal won’t be as nice looking after sanding, but they will be much safer. This is clearly a design oversight, perhaps born of developing the product in an office rather than using it as most riders would, where we often walk alongside our bikes or carry them. There is no practical or functional reason for the pedal’s edges to be sharp, yet there is every reason for them to be rounded out. 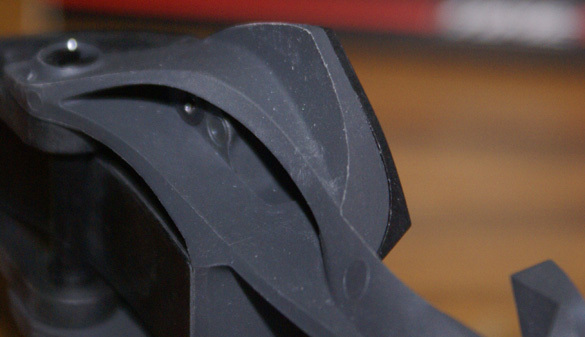 The razor-sharp edges of Time Xpresso pedals can cause deep wounds. The problem does not affect the function of the pedal, but after sustaining superficial yet painful cuts on nearly every ride, and finally a deep laceration (about 3/16″ deep) on the ninth ride, I decided action had to be taken to solve the problem, or I would have to ditch the pedals. The good news is that a piece of 220-grit sandpaper and a quick bit of sanding action will round out those dangerous surfaces. The surface easily sands down, so be sure to choose a fine grit sandpaper. Be careful at the outer edge to not sand too deep, as the surface mates with the thin metal platform on the top of the pedal, and some of the edges at the front border where the cleat engages. After sanding the edges of the pedals, I have not sustained any cuts from brushing against them. 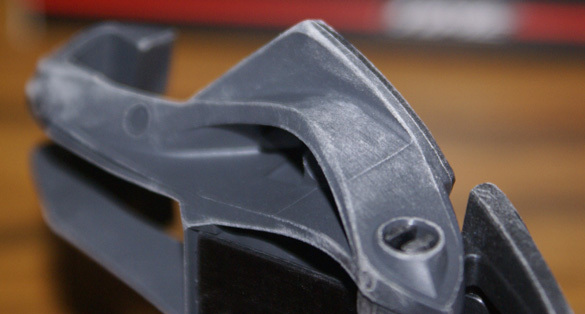 NOTE: The sanding works fine on the plastic resin of the Xpresso 4, but it may be structurally detrimental on the upper end carbon fiber models. Tools needed: 3mm and 6mm Allen wrenches, Phil’s grease. Time Xpresso pedals could not be easier to set up. Check your old cleat position, measuring from the front of the shoe to the front of the cleat, and simply duplicate it. Always use a bit of grease on the screw threads so that your screws don’t get stuck or accidentally come unthreaded. Time includes a tiny optional shim with an adhesive back to compensate for the different curvature of cycling shoes. The shim is cut to match the very front tip of Time’s Xpresso/iClic cleat, and works perfectly in mating the cleat and sole of my Sidi shoes. The shim tends to slip over time, and may need re-glueing eventually. The front of the cleat provides a wide washer socket that allows you to angle the cleat on your shoe if needed, or you can mount it straight forward too. Older Time cleats were made of heavy brass and aluminum (and later a soft plastic), but the Xpresso cleat is made of a durable hard resin material that stands up admirably to walking on pavement. Mount your pedals on the bike with a few turns of your 6mm Allen wrench, and you’re set. The Xpresso without question features the easiest engagement of any pedal I have ever used. It’s so easy, in fact, that I find myself accidentally clipping in quite frequently. Simply resting your foot on the pedal can result in pedal engagement. The engagement is so smooth that I basically do not have to think about it. That is really what you want in a pedal. In my review of Time’s predecessor to the Xpresso, the iClic pedal, I cited the problem with unstable pedal engagements, a problem which Time denied existed. Later research showed the problem was well-documented on racing forums. Time seems to have addressed the issue, and while it is still possible to mis-engage the pedal by clipping in from an angle, the likelihood of this is much less. 99.9% of my Xpresso pedal engagements have been perfect. Time’s biopositioning ensures the smoothest float in town. In contrast to Look and Shimano pedals, the float is completely smooth, so smooth in fact, that you won’t even feel it. The pedals let your foot move how it naturally would, without any side-to-side clunky feeling cleat engagement. If your knee tracks inward or outward, these pedals support you through the entire pedal stroke, never torquing strangely on the knee or supporting tissues. Time Xpresso pedals are hands down the best road pedals on the market for anyone who suffers knee pain before, during, or after riding. The bioposition design is right in line with the BikePT philosophy of fitting the bike to the rider, allowing for the unique nature of human bodies. 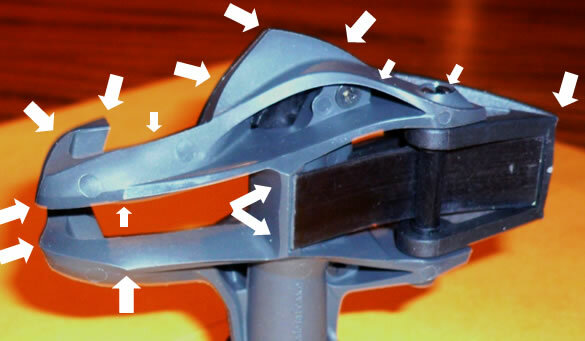 Rather than forcing you to torque your knees or center your cleat position, Time Xpresso pedals allow you to set your own cleat angle, choose your float amount, and ride pain-free. Setup is incredibly easy to boot. The only draw-back is the razor-sharp edges, which you may want to carefully sand down. Hopefully, Time will round out the edges in a future version.